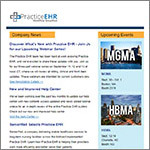 Insights, product updates and other news from Practice EHR. SeniorWell is a mobile healthcare company delivering on-site podiatry, optometry, dentistry, and audiology services to seniors residing in long-term nursing facilities. 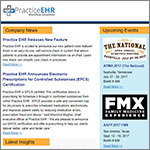 Practice EHR LLC’s Practice EHR V12 has achieved Office of the National Coordinator for Health Information Technology (ONC-Health IT) 2015 Edition Health IT Module Certification via Drummond Group LLC, an Authorized Certification Body (ACB) that has been empowered to test software for compliance with the requirements of the federal government’s program. 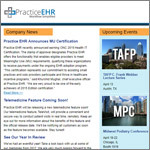 Practice EHR earns EPCS certification, improving provider workflow and patient safety.